Part of Honolulu Surf Film Festival 2018. Follow two different group of surfers on their coldwater surf adventures. A new short film on the UK’s northern shores precedes. Directed by Chris McClean. 2018. UK. 6 min. UK surfer Sandy Kerr puts his home waves on display. Directed by Mike Bromley & Ryan Meichtry. 2017. Canada. 27 min. Inspired by the classic maritime novels about the cruel and dark North Atlantic, Perilous Sea follows a group of professional surfers around the different frozen and rugged corners of the North. Striving to be the first surf film to take place entirely in the North Atlantic the film is complete after three years of production. Perilous Sea was shot on location in Iceland, the Canadian Maritimes, and Ireland. Directed by Ben Gulliver. 2017. Canada. 43 min. The Seawolf is the latest from awarded filmmaker Ben Gulliver who follows seven professional surfers on a two-year, jaw-dropping, cinematic journey in search of remote, frigid waves. 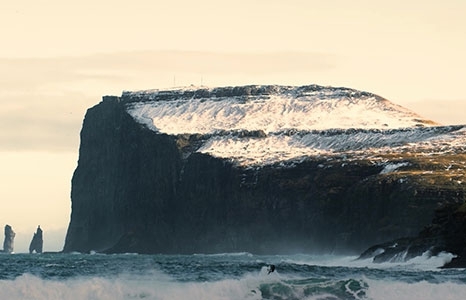 This cold-water surf film documents the best of the best as the navigate icy waters in Norway, Scotland, New Zealand, Canada, Australia, and The Faroe Islands. For decades, the search of new and isolated waves has been inspiring surfers and filmmakers alike. With the progression of wetsuit technology and the desire to go further, the possibilities of triumph in visual cinematics and surf are exceeded with The Seawolf. The glacial water and sweeping blizzards provide the ultimate backdrop for high performance surfing. The drive to find untapped waters, results in an epic look at surfing through a traditional lens in unfamiliar territory. Set to the an original soundtrack by Ben Gulliver (Director) and Greg Bevis (Bear Mountain), the jazz, hip-hop and electronic inspired mix follows the high intensity crew, as they travel across the world.